New flexible timings for below 4 year kids! 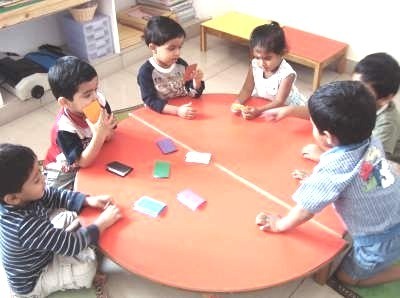 Little Scholars is a Montessori House of Children undertaken by Little Scholars Educational Society serving children between the age group of 2 to 10 years. The management of Little Scholars feels that children need the benefits of having individual attention, as the first formative years are very crucial and also difficult from the perspective of the child. The Management and staff of Little Scholars believe that every child deserves a safe, warm and caring environment to grow and develop. The Management arranges workshops to educate parents on the various powers and potentials that children have from 0 – 12 years and how children can be supported at home for optimum development. Another important aspect of Little Scholars Educational Society is being a role model to its Children while serving the society by imparting education for the needy after the school hours. Little Scholars mission is to be a home away from home for your child. Its main aim is to provide and nurture the child so that he/she can grow to become an independent human being with a desire to explore the world and understand it to the best of his/her ability. It also provides the attention that each child deserves at this age that is the adult-child ratio is the best when compared to any school in and around Hyderabad. We observe five days a week for children. Parent interesting to visit the environment are requested to visit us after 3:00 p.m.
9:00 a.m. to 03:00 p.m. - Above 4 years. Copyright © 2012 Little Scholars Educational Society. All Rights Reserved. Powered by Rational Ego Technologies.